Hundreds of graduate students attended Rice University’s International Graduate Student orientation. The U.S. still attracts record numbers of international students, but the sticker shock of college tuition and negative political rhetoric are slowing down the robust rate of application seen over the past decade. “These relationships are critical in a competitive marketplace,” said Marie Royce, assistant secretary of state for Educational and Cultural Affairs at the U.S. Department of State, bringing $42 billion and 450,000 jobs to the U.S. economy. But tuition costs — around $20,000 a year for public institutions to more than $70,000 for elite private universities — make the U.S. look less attractive to international students, as global competition increases, educators said. Among undergraduates, 82 percent rely on personal and family funding. Most are not eligible for financial aid at U.S. schools. Over the past 30 years, said Rajika Bhandari, research and strategy senior adviser at IIE, costs increased 213 percent at U.S. public institutions and 130 percent at private U.S. institutions. Foreign countries have taken note and are attracting students with far less expensive tuition and pathways to permanent residency or citizenship. 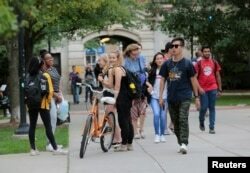 Students walk on campus at the University of Michigan in Ann Arbor, Michigan, Sept. 19, 2018. Pathways to citizenship are important to international students whose home countries have not reached the same quality of life and excellence in education. Many students — the best and brightest immigrants from their countries — want to work in the U.S. before returning home. Or they want to stay in the U.S., where freedom, excellence and innovation have been hallmarks of the economy. China and India send nearly half of all international students, 363,341 and 196,271, respectively, to the U.S. A currency correction in India two years ago wiped out funding sources for many students there hoping to head to the U.S. And Chinese students, who dominate the population of international students, report growing discontent with paying full tuition next to subsidized domestic students. “The current financial model for higher education isn’t sustainable,” offered Lynn Pasquerella, president of the Association of American Colleges and Universities. “We can’t raise tuitions and have burgeoning loan debts” for international or domestic students. In addition to costs, international students and their families tell educators they are daunted by political rhetoric, feeling unwelcome and wondering if the U.S. is a friendly and safe place to study. The Trump administration’s immigration policies have limited student visas and how they are administered. “We became very comfortable that we had such a lead above other countries and that we’re such a preferred destination,” said Robin Lerner, president and CEO of the Texas International Education Consortium, “and an over-reliance on a number of countries where governments are funding students,” such as Saudi Arabia and Brazil. Safety issues, too, trouble international applicants, educators said, who ask if their children will be safe in the U.S.
Mourners pray during a vigil to remember victims of a mass shooting in Thousand Oaks, California, Nov. 8, 2018. ​Anti-immigrant comments are “inflammatory,” said University of Southern California’s Timothy Brunold, dean of admissions. He said he travels internationally often, speaking with prospective students and their families. “I am endlessly questioned about this. 'Will my son or daughter be welcomed in the United States? Will they get a visa, but will it be taken away? Will there be an opportunity to work in the U.S. Or will there be a limit? '” Brunold said. “Yes, we are hearing that, too,” said University of Colorado-Boulder's Natalie Mikulak, associate director of international admissions. While experts said the dip in new enrollments can be attributed to a mixture of factors, the slide in numbers coincides with the so-called travel ban that limited immigration from seven mostly Muslim countries in early 2017. When ordered, President Donald Trump said it was a national security measure. The orders had a chilling effect on international student enthusiasm for the U.S., experts said. If a student’s visa is rescinded before graduation, they may have to start over in another country. ​Nearly two years later, the U.S. severely limits student and exchange visas only to Syria and North Korea, said Laura Stein, visa policy analyst at the Bureau of Consular Affairs last week. Stein said applicants from those countries may apply for a waiver from the presidential proclamation. Since Oct. 31, 2018, she said, 2,072 waivers have been granted. National security, educators said, is built on sharing American democracy and standards with international students who will carry that positive relationship with them throughout their lives.